In the scenic countryside between corn fields and a historical setting that includes a castle and an idyllic park ceramic artists Karen Bennicke and Peder Rasmussen reside. 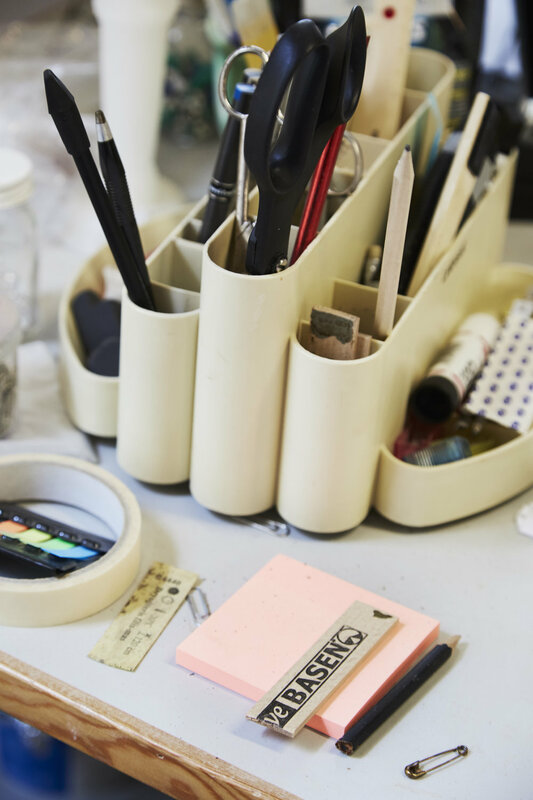 For more than 25 years they have lived and worked alongside in the house that holds a large studio next door to the kitchen and the living room - and the two ceramicists really do live the dream. The house both have spacious storage and several kilns to work from, and often colleagues come to spend the weekend working and experimenting in their generous studio home. 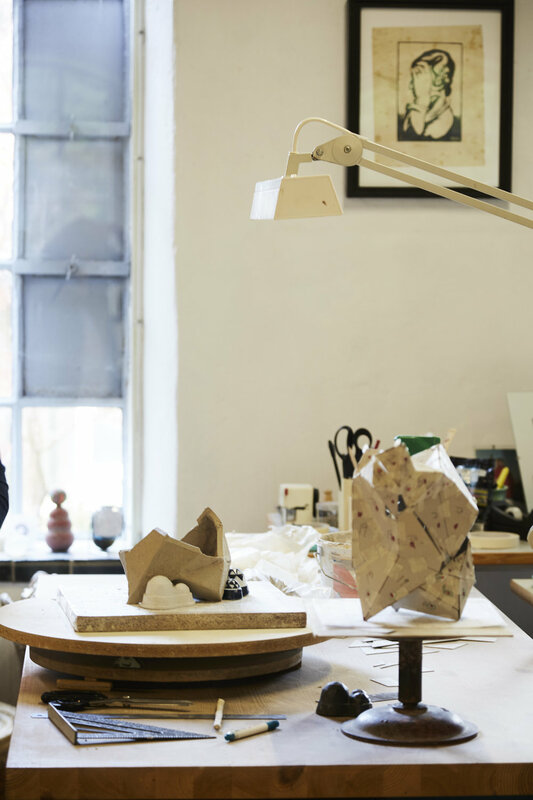 Honoured throughout their careers with numerous awards, both Karen Bennicke and Peder Rasmussen are well established ceramic artist in Denmark and abroad, where they exhibit on a regular basis - in fact, Karen recently exhibited in Paris. 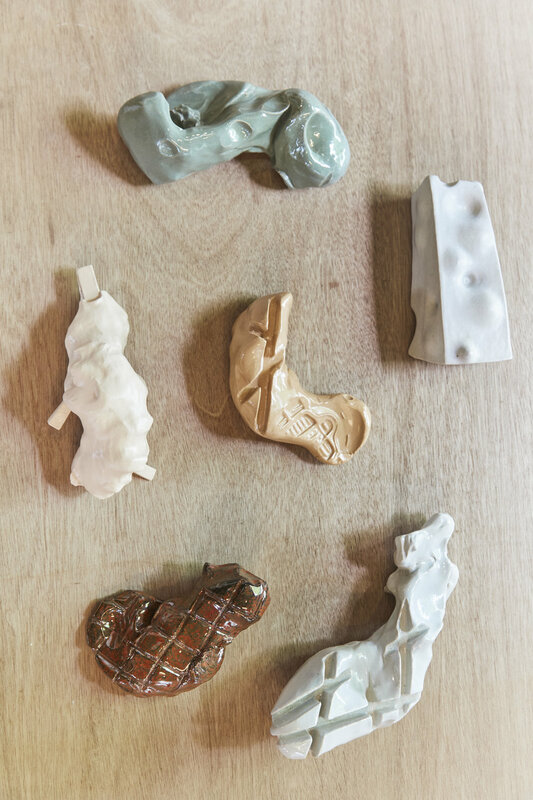 Karen Bennicke has been working with clay for 50 years. A journey that departed from the potter's wheel with cups and bowls in her own studio shop at a young age, but slowly developed into artistic sculptures that interpret and evolve around architecture. Architecture as principle and form. Architecture as space between surfaces, shapes and angles. Architecture defined by the inside and the outside space of the sculpture. 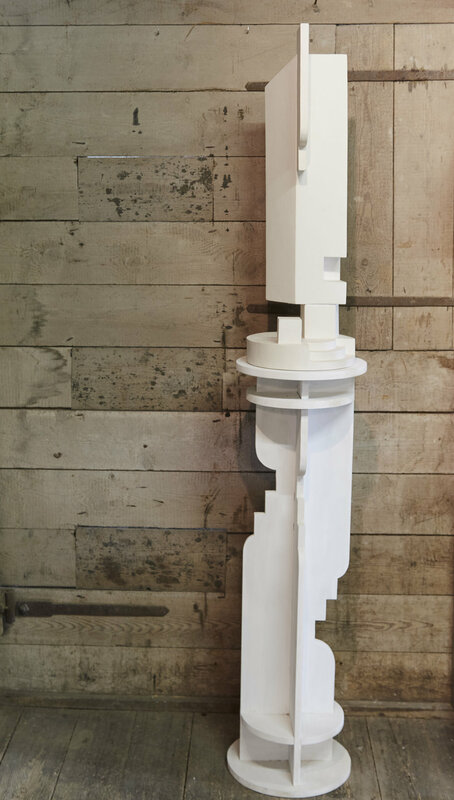 Karen Bennicke is into mathematical precision with which she builds and develops her sculptures, and her work is both minimal and complex at the same time. Just like architecture. 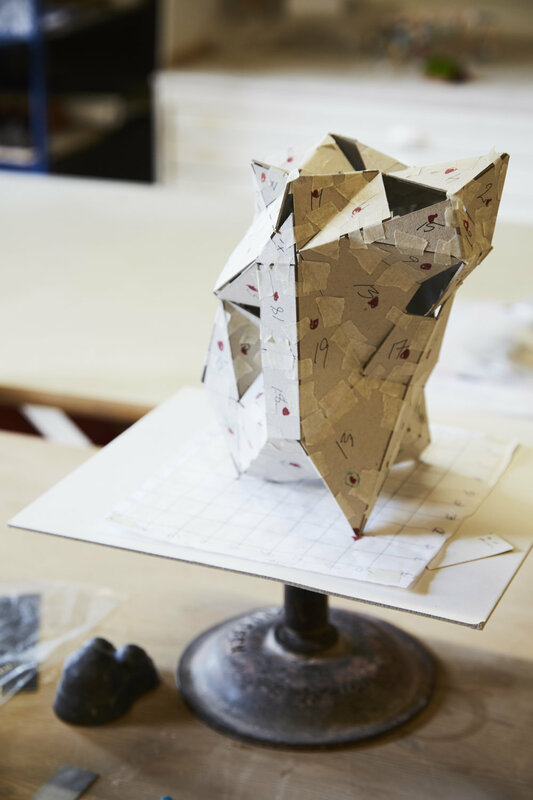 Karen is the nerd that you'll find in the studio glueing paper scraps to form the pyramid shape of her next sculpture or as the student with her nose buried in a book about diamonds and how to grind and carve them. Because fascination derives from a deep understanding of skills and know how. And just as nerdy as her intellectual and logical side might define her, the intuitive artist and the skilled craftsman is the person that interacts slowly with the sculpture while creating them just as she is the person that still collects bits and pieces she finds in the street. Like half of the clothes peg that later turns into a vertical mural relief. Like the street grid of the arrondissements in Paris or the shape of a bicycle track that set off the inspiration for several pieces. Karen has been honoured throughout her career, but in the last couple of years, she has been awarded some of the finest titles that you can receive as a Danish artist - the lifelong grant from the Danish Art Foundation and the Thorvald Bindesbøll-medal - which only a few have received before her in the same year. 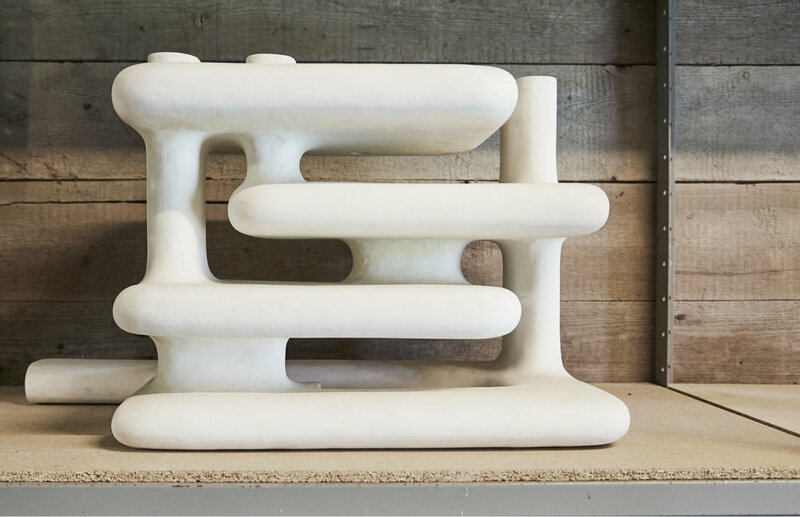 Karen Bennicke is genuinely one of a kind when she explores and expands the norms for ceramic shapes and perceptions in the field of contemporary ceramic art. Karen is known for her use of colour, and she always combines form and expression in a monochrome palette that underlines the shape. Adds yet another layer of connotations or aesthetics. Underpins the contrast of light and shade. Of angles and glaze. 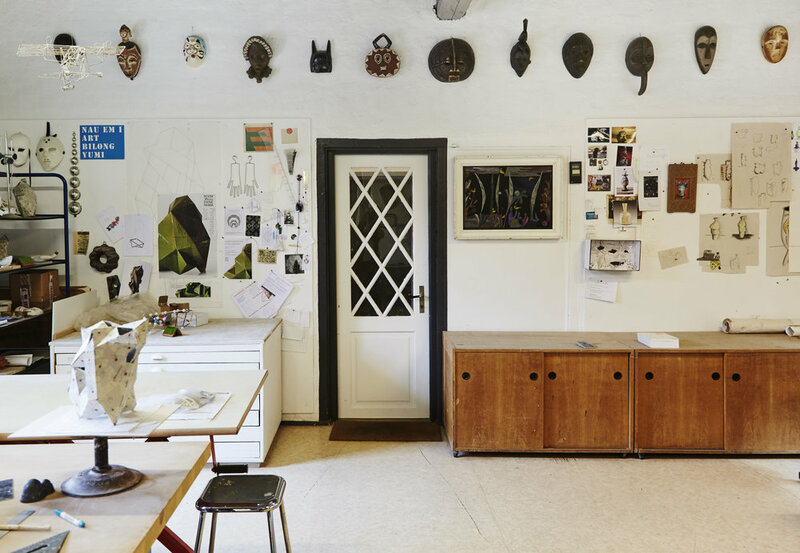 Of norms and traditions that are all created in the warm and generous surroundings in the house in the Danish countryside, where she and Peder use each other as sparring partners, friends, parents and artists.